A strong brand is one of the most underrated tools of a successful business. It’s a powerful way to build the know-like-trust factor with your audience. It makes your business feel real, like a three-dimensional person — and because people buy from people, this is a huge help when it comes to making sales online. 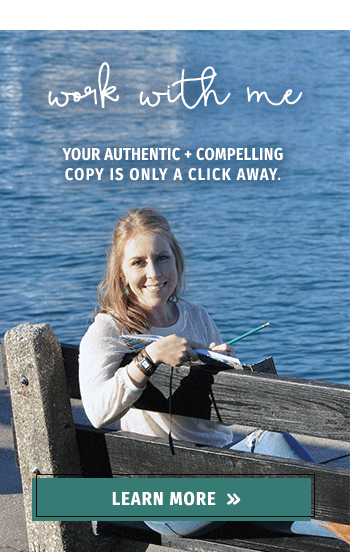 And the truth is, it’s really, really, really easy to create a strong brand through your copy. It actually takes just two steps. As a one-woman show, I don’t have the luxury of making giant brand boards and spend time culling down my “ brand essence” (whatever that is). These two easy steps serve me just fine! I use this process to infuse myself into my own copy and to write copy for my clients that really juices up their brand and feels 100% like them. You probably love a gajillion different things. I get it! But when it comes to copy, less is more. I’ll be super honest here: Harry Potter isn’t the only book I love. It’s my favorite, for sure! But I also love a bunch of other books that never show up in my copy. Because in order to build your brand, you need to consistently talk about a small handful of things. Readers like simplicity. If you’re always talking about your 10 favorite TV shows, people aren’t really going to remember that. But if you always quote Friends, it’s going to really stick in people’s minds. If you talk about too many things, if you’re constantly bouncing from this thing you love to that thing you did to this other thing about you, readers don’t walk away with a strong sense of anything. Whereas if you focus on just a handful of strategic elements, people will start to associate those things with your brand. What I call your Brand Handful is a few intentional elements —3-5 is a good place to start — that represent your brand. You want these to be topics that you can come back to again and again in your writing. Simply think about all the things that could represent your brand and then pick 3-5 to get you started. The final step is to start writing about your Brand Handful. The next time you’re creating an email, blog post, page of website copy, social media posts, even sales copy, reference the things in your Brand Handful. Between storytelling, references, and photos, there are so many opportunities for you to tap into your Brand Handful to show your audience who you are. Don’t get overwhelmed with this! Less is more here. In order to build your brand, you need to consistently talk about a small handful of things. You can take this idea even further and apply it to your brand messaging. You also want to do this with your emails, blog posts, web pages, social media…all of it! When you consistently talk about a few key messages, they seep into reader consciousness quickly. Repetition is critical to changing reader beliefs and getting them comfortable with what you’re all about. Don’t worry, repeating key brand messaging doesn’t feel repetitive to your audience. When you do it the right way, they won’t even notice. But it does train them and get them familiar with your key messages, consciously and unconsciously. This topic deserves a whole blog post to itself someday. But for now, have a think about what your key messages might be. What messages do you want people to associate with your brand? What are 3-5 big messages you need people to believe? Solid branding is much simpler than people think. Sticking to your Brand Handful and key messaging are two easy ways to make your brand feel YOU-ier and help readers get to know you more. Like smart, easy branding tips like this? Then you’ll love Welcome Sequence Wonderful. We explore the concepts of repeating key messaging and infusing your brand in detail inside the course — while creating your captivating email welcome sequence. By the time a new subscriber finishes your welcome sequence, you’ll have them on-board with your messaging and comfy cozy with you as their bud…so they’re primed and ready to say “yes” to working with you. The program only opens twice per year — Click here to join the waitlist. What are TWO elements in your Brand Handful? What is ONE key message you want your readers to know? What other strategies do you have for sharing your brand with your audience?